Look at the roots of the chords and you will note that I am moving in thirds. I very rarely do that. Tons of writers do and I am not saying that they are wrong. It is just not my thing, and I am going to explain why from a technical standpoint. Before I do, I want to remind you of that clip of John Innes that I posted a few weeks back. Someone wrote me and said something interesting. She said that the harmonic progressions made her ear tired because they seemed to never quit; they were always moving forward. Everyone is welcome to their opinion and that is why lots of arrangers write progressions built on thirds. However, my perspective of Innes’ playing is pretty much the opposite of that reader. I love the motion and the way the chords work together seamlessly, especially when you throw in the voice leading. Innes’ harmony is based on modern harmony principles where chord choices are evaluated based on function and other factors. It is quite clever stuff. Moving around in thirds is child’s play in comparison. 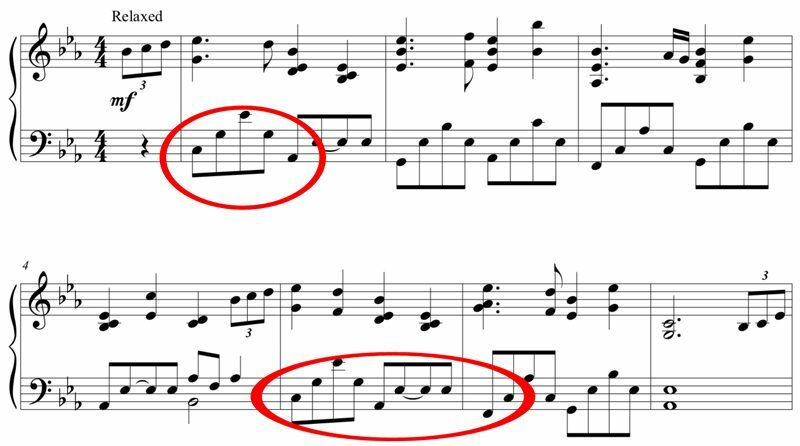 If I were to tell you in one sentence why moving in thirds is not ideal in your writing, it comes down to this: moving in thirds does not take advantage of harmonic movement that comes from cycling through chord functions. If you have dozens of chord possibilities but they all fit into just three general categories, you sort of have to be careful because if you are picking chords at random, you are likely to end up with a few chords in a row of the same function. For example, let’s look at the seven diatonic chords: I and iii7 are both tonic. IV, ii, and vi usually are subdominant (vi sometimes feels more tonic). and V7 and vii7(b5) are dominant. Look at those chords again and you see something rather obvious and it is this: the chords with the same function tend to be a third apart. For example, if you start at vi and move to IV and then ii, you are moving the root but not changing the function. It is not the best sound in the world; it feels static and maybe a tinge amateurish. I know you hear that kind of thing in way too many new age piano songs you listen to but that does not mean it is ideal. Moving in a third is not really moving much of anywhere an awful lot of the time. If you ever take a functional harmony class, you will probably learn that moving by a third is the weakest movement you can do. There are not too many movements to choose from in the first place: besides thirds, you can really only move in steps, fourths, and fifths– and all of those are superior to thirds. Someone is going to write me and complain about what I am saying so I want to be clear. I am not saying that moving in thirds is wrong or bad. I am not saying that you should never do it. I am not saying that chords have to cycle between functions every few beats or at all. I am just saying that as a general rule, I think it is best to move in thirds sparingly. By the way, here is a little tip: a very easy way to beef up music where there is a lot of movement in thirds is simply to insert a step in the middle. In other words, turn those thirds into two seconds. It almost always is possible and that extra chord often changes the function for you, creating a better motion. This concept is new to me! Then “Heart and Soul” is not the pinnacle of achievement in harmonic progression? 🙂 It remains popular though, along with neo-classical/new age. Maybe it’s because many listeners like the stability/peacefulness of movement by thirds, and don’t need as much motion/energy? Just a thought. Great post! !